What do you call somebody that speaks two languages? What do you call somebody that speaks three languages? What do you call somebody that speaks only one language? Without taking offense to the joke, we might realize that this is a little closer to the truth than we care to admit. Fortunately, technology is always there to fix our flaws! Below you’ll find a few websites that can help bridge the gap and destroy any language barriers. Babel Fish used to be the pride and joy of AltaVista, i.e. the only reason I ever went to that search engine. In 2008, the service moved from AltaVista to Yahoo!, but years of no new features has left the once-ahead-of-its-time stagnant service behind as a fairly standard translator. Hopefully the move to Yahoo! might change that, but it doesn’t seem likely since the service does not even get a prominent position on the web portal’s homepage. Babel Fish handles all the standard languages well and can also just accept a URL to translate an entire web page instead of the standard pasted in text (up to 150 words). 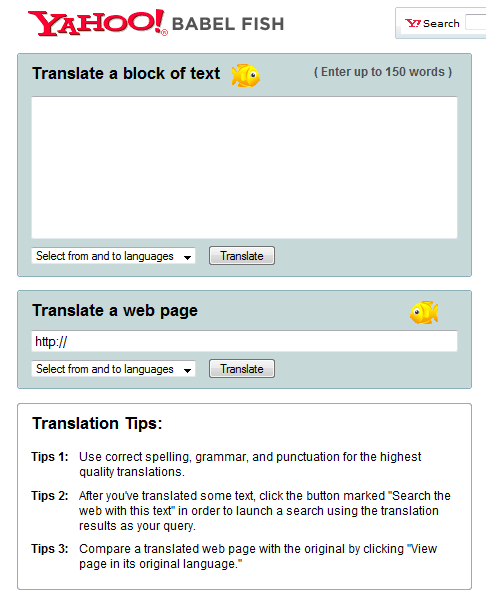 Similar to Babel Fish, Microsoft offers another fairly standard translator with their Windows Live Translator. Google Translate is right up there with Babel Fish as a standard translation tool, but there are a few tricks up Google Translate’s sleeves that earns it its own mention. Google Translate is better than Babel Fish in almost every way. Sharing a lot of the same features like translating pasted text and web pages, Google Translate has no (identifiable) word limit, Tested up to 80,000+ words. A little more substantial than the 150 word limit of Babel Fish. 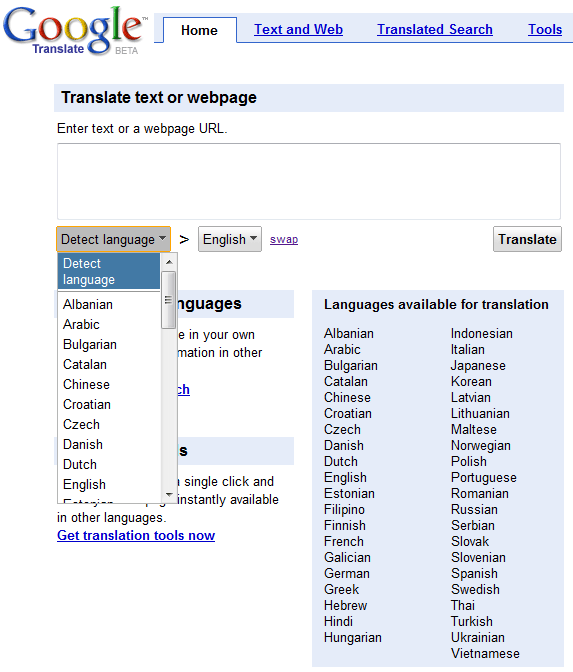 Google Translate also supports many more languages in addition to all the standard romance languages, like Albanian, Catalan, Bulgarian, Czech, Indonesian, Thai, and many more. The coolest feature of Google Translate in my land-locked Midwest American mind, however, is the Detect Language function. Instead of having to know what language you need something translated from, detect language can automatically attempt to figure it out and translate the text for you. Similar to having to know how to spell a word before you can look it up in a dictionary to check the spelling of the word, most translation services overlook this step. I applaud Google Translate for this feature. Send Google a URL and they’ll translate the page for you if they have that language. Even if they don’t, the error message will usually tell you what language it is and that’s half the battle right there. Thanks Google Translate. Even your error messages are helpful! 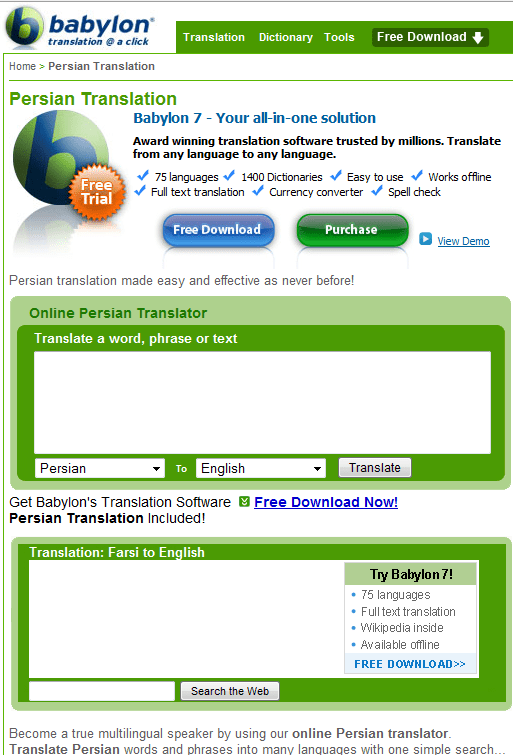 Taking my fresh recommendation from Google that I need to find a Persian (Farsi) translator, I stumbled upon Babylon. Babylon is a little less feature-rich than even Babel Fish: You can’t send it a URL (only pasted text) and its language list is not as full as Google Translate. However, it did happen to have what I needed, a Persian to English translator. The translation was far from perfect, but it was enough for me to get the jist of what was written. If you know of any other really good translation services, add them in the comments.